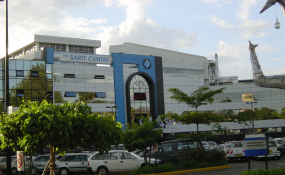 Sarit Center in Nairobi has denounced a security alert over a possible attack at the shopping complex which widely was circulated on social media late on Tuesday evening. "Hi all pls avoid Sarit Centre there is an alert. Tell your friends and family and take care. Alerted by some people on the ground that heavy police presence to avert possible attack." But in its respond on Wednesday the facility's management dismissed the alert as a mere 'gossip'. "We would like to ensure all our shoppers and the public at large that these messages are merely gossip and should be treated as such. We have not received any specific alert from the authorities regarding a heightened state of security at the Sarit Centre and we continue to work with them to do our level best to provide our shoppers with a safe and comfortable shopping environment," read part of the statement. The management has asked the public to refrain from sharing and forwarding any unverified information. "These messages are only aimed at spreading endless fear and panic," the facility's management further said. The alert comes barely a month after the Dustin attack that claimed the lives of 21 people with several more injured.